I am writing from the Bole Ambassador Hotel in Addis Ababa, Ethiopia’s capital city, also known by its Oromo name, Finfinne. It is late at night, and tomorrow I have another busy schedule, so I hope you will excuse the hasty and sloppy style of my writing in this blog post, but I wanted to speedily tell about my trip so my friends, family, and colleagues back home could follow my experiences day-by-day. My colleagues Stephen Greenwald (director of film and media initiatives at Wagner College), Jennifer Dworkin (documentary film-maker), and I arrived in Ethiopia late Saturday night to join my good friend and collaborator, Dhaba Wayessa (Voice of America journalist and all-around renaissance man) who travelled ahead of us to prepare for our project. Our trip has several goals: (1) to continue my ongoing research about the cultural history of America’s relationship to Ethiopia, (2) to investigate the state of cinema in Ethiopia and the potential for its development, (3) to give two quick, introductory seminars for Sandscribe Communications on the business of film and documentary film-making, and (4) to look for potential partners for education abroad opportunities and international exchange with the college where I work in New York. On Sunday, I woke up and went for a quick jog around the neighborhood and soon discovered that either I hadn’t had enough sleep after 20 or so hours of airplane travel or wasn’t used to the high altitude of Addis Ababa (almost 8,000 feet above sea level.) After breakfast, we all met to discuss the agenda for the week, go out for lunch, and do a little tourism, driving up the forested Mount Entoto above Addis and checking out the Church of St. Mary, the site that inaugurated the religious dimension of the colonization of the Oromo town by the Abyssinian empire. Today, Monday, we began our work and were joined by the scholar from Italy Alessandro Jedlowski, currently doing postdoctoral study in Belgium on the production and distribution of film in Africa. 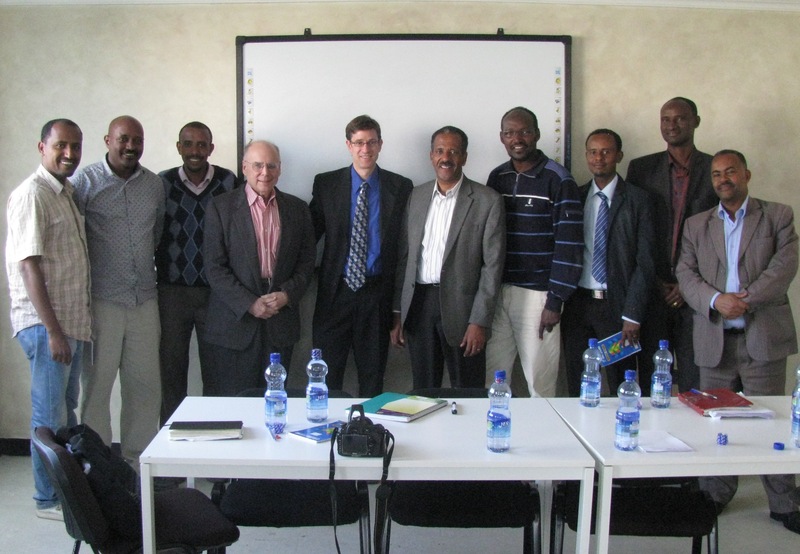 We began by meeting with a local entrepreneur to discuss the state of finance and the legal framework business in Ethiopia. Though not directly related to film and the goals of our trip, the question of capital investment and the rather unique system that governs business in Ethiopia is germane to the potential for film production. After an unexpectedly entertaining and surreal — and therefore especially useful — conversation, we drove to visit the studio of a brilliant local film-maker named Paulos Regassa, director of the dramatic film Ashenge and many documentaries, to discuss the challenges and opportunities of making films in Ethiopia. We then went for lunch and briefly met with someone from Resources for the Enrichment of African Lives (REAL), an organization that provides mentors and support for disadvantaged girls in the Oromia region of Ethiopia and in the United States to discuss the possibility of filming a few of the girls in the organization. After lunch, we all traveled to the Bole campus of the extensive Rift Valley University College. There, Dhaba, Steve G., and Steve T. met with several faculty and administrators. We explained our goals (as I outlined them above), and they explained the history of their school, and we discussed possible points of mutual interest and future endeavors. They were a wonderful and enthusiastic group. Meanwhile, Jennifer led a workshop on documentary film with some Sandscribe Communications students. Later in the evening, we were treated to a tasty dinner at the Hilton Hotel by the president of Rift Valley, Dinku Deyasa. At some point, I want to theorize about one of the main topics of conversation that we had to today and the many things I learned regarding the question of film and media production in Ethiopia, since theorizing is the sort of thing that I usually do in this blog, but it is now midnight, and tomorrow is another busy day, and that is precisely the question that all of us will formally give a public presentation about tomorrow afternoon. Stay tuned! ← The Whence and Whither of Film Studies… or, is the cinema really dead?